Dowsing, in general terms, is the art of finding hidden things. Usually, this is accomplished with the aid of a dowsing stick, rods or a pendulum. Also known as divining, water witching, doodlebugging and other names, dowsing is an ancient practice whose origins are lost in long-forgotten history. Many new age dowser's believe that the body has access to information that we consciously do not know and use these devices to amplify the bodies movements to tell us this information. There are several ways to go about dowsing. Map dowsers use a dowsing device, usually a pendulum, over maps to locate oil, minerals, persons, water, etc. More recently some simply use a pendulum to ask a question and read the movement of the pendulum to give a yes/no answer. 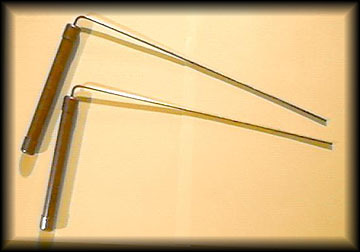 However, the original dowser is the field dowser who walks around an area using a forked stick to locate underground water. When above water, the rod points downward. (Some dowsers use two rods. The rods cross when above water.) Various theories have been given as to what causes the rods to move: electromagnetic or other subtle geological forces, suggestion from others or from geophysical observations, ESP and other paranormal explanations, etc. Some people are less interested in why these devices move rather than whether dowsing works. Obviously, many people believe that they do work. A study was undertaken in Kassel, Germany, under the direction of the Gesellschaft zur Wissenschaftlichen Untersuchung von Parawissenschaften (GWUP) [Society for the Scientific Investigation of the Parasciences]. The three-day test of some 30 dowsers involved plastic pipes through which water flow could be controlled and directed. The pipes were buried 50 centimeters under a level field, the position of each marked on the surface with a colored strip. The dowsers had to tell whether water was running through each pipe. All the dowsers signed a statement agreeing this was a fair test of their abilities and that they expected a 100 percent success rate, however the results were no better than chance. The testimonials of dowsers and those who observe them seem to provide the main evidence for dowsing. The fact that this pattern of dowsing and finding something occurs repeatedly leads many dowsers and their advocates to make the causal connection between dowsing and finding water, oil, minerals, etc. This is type of flawed reasoning known as post hoc reasoning and is a very common basis for belief in paranormal powers. It is essentially unscientific and invalid. Scientific thinking includes being constantly vigilant against self-deception and being careful not to rely upon insight or intuition in place of rigorous and precise empirical testing of theoretical and causal claims. Every controlled study of dowsers has shown that dowsers do no better than chance in finding what they are looking for. I remain unconvinced that dowsing can actually tell us information about the physical space around or the future and that those who claim to have successfully dowsed such information is wholly based on chance alone since scientifically results are not precisely repeatable.